IBM® Flex System™ is the next generation of smarter computing that integrates multiple server architectures, networking, storage, and system management capability, into a single system that is easy to deploy and manage. IBM Flex System Manager has full, built-in virtualization support of servers, storage, and networking to speed provisioning and increase resiliency. In addition, it supports open industry standards, such as operating systems, networking and storage fabrics, virtualization, and system management protocols, to easily fit within existing and future data center environments. IBM Flex System Manager is scalable and extendable with multigenerational upgrades to protect and maximize IT investments. IBM® Flex System™ Manager (FSM) is a systems management appliance that drives efficiency and cost savings in the data center. IBM Flex System Manager provides a pre-integrated and virtualized management environment across servers, storage, and networking that is easily managed from a single interface. A single focus point for seamless multichassis management provides an instant and resource-oriented view of chassis and chassis resources for both IBM System x® and IBM Power Systems™ compute nodes. You can reduce the number of interfaces, steps, and clicks it takes to manage IT resources, intelligently manage and deploy workloads based on resource availability and predefined policies, and manage events and alerts to increase system availability and reduce downtime while reducing operational costs. The IBM Flex System Manager management appliance is shown in the following figure. IBM Flex System, a new category of computing and the next generation of Smarter Computing, offers intelligent workload deployment and management for maximum business agility. This chassis delivers high-speed performance complete with integrated servers, storage, and networking for multi-chassis management in data center compute environments. Furthermore, its flexible design can meet the needs of varying workloads with independently scalable IT resource pools for higher utilization and lower cost per workload. While increased security and resiliency protect vital information and promote maximum uptime, the integrated, easy-to-use management system reduces setup time and complexity, providing a quicker path to return on investment (ROI). IBM Flex System gives forward-thinking companies a way to completely rethink deployment and management of their IT environments; it offers an opportunity to evolve to a more open, agile, and integrated computing system that is dynamically managed from a single vantage point to simultaneously maximize efficiency and innovation. IBM Flex System Manager is designed to help you get the most out of your IBM PureFlex System while automating repetitive tasks. IBM Flex System Manager can reduce the number of manual navigational steps for typical management tasks. From simplified system setup procedures with wizards and built-in expertise to consolidated monitoring for all of your physical and virtual resources (compute, storage, and networking), IBM Flex System Manager provides core management functionality along with automation so you can focus your efforts on business innovation. With a workload-optimized approach, you can decrease infrastructure costs and improve service levels. You can create and modify system pools using virtual workloads, make dynamic virtual workload adjustments, and move workloads within system pools, resulting in an optimized virtual environment with increased resilience to cope with planned or unplanned down time. A system pool is a group of virtualized system components that are managed as a single entity, allowing you to manage the pools with the simplicity of managing a single system, which is an essential capability for moving to cloud computing and a dynamic infrastructure. Beginning with deployment through maintenance, upgrades, and problem resolution, IBM Flex System Manager is designed to provide all of the key management functions for your integrated IT resources from a single, easy to use interface. From your office or remotely through a secure connection, you can manage your compute, storage, network and virtualized resources. Auto discovery and setup wizards make deploying compute nodes quick and easy using the IBM Flex System Manager. After it is deployed, IBM Flex System Manager provides real-time updates for compute node “health” summaries. With the ability to define performance thresholds to trigger alerts, you can automate responses to potential problems help keep your critical business applications running at peak performance. IBM Flex System Manager can detect many problems with essential system resources and recover automatically. IBM Flex System Manager can also perform trend analysis to forecast and prevent future problems that otherwise might lead to expensive system outages. IBM Flex System Manager helps you address storage management challenges from device deployment and through the data life cycle. Storage deployment capabilities in the IBM Flex System Manager include storage device discovery and simple logical and physical device configuration from a single interface. IBM Flex System Manager can provide physical and logical storage topology views and can show relationships between storage and server resources, giving you the ability to track key resources based on their business usage. Provisioning capabilities include image management for simple virtual machine creation, deployment and cloning. You can also manage storage system pools for data life cycle management and storage placement based on business policies. Networking resources allow your virtualized compute and storage resources to communicate and function in the cloud. IBM Flex System Manager delivers end-to-end network management for your PureFlex System from a single tool. IBM Flex System Manager supports automated network discovery to speed deployments. It also offers a graphical view of the network from the integrated user interface. Network resources are pooled and virtualized. With logical network profiles, you can quickly and easily specify the network connectivity characteristics of a virtual machine. IBM Flex System Manager supports automatic provisioning and simple movements of virtual LANs for virtual machines. You can manage MAC addresses for virtual network interface cards. IBM Flex System Manager provides detailed network usage and performance statistics for virtual machines and physical compute nodes so you can track valuable network resources and manage them based on your business needs. The basic virtualization functions in the IBM Flex System Manager begin with the ability to create and manage virtual servers from pooled resources. IBM Flex System Manager takes this capability further through the application of built-in expertise to make provisioning and deployment of virtual machines fast and easy. After virtual machines are deployed, the virtualization features of IBM Flex System Manager are designed to help you manage these virtualized resources efficiently. Automation features such as dynamic virtual machine placement, automated optimization, and resource balancing simplify virtualization management. IBM Flex System Manager also helps you keep your virtual machines up and running with support for nondisruptive updates, virtual machine mobility, and a range of other resilience features. The IBM Flex System Manager appliance is based on an x86 compute node that comes with preloaded management software. The software contains a set of components that are responsible for performing certain management functions. These components must be activated using the available IBM Feature on Demand (FoD) software entitlement licenses, and they are licensed on a per-chassis basis, that is, you need one license for each chassis you plan to manage. The management node comes standard without any entitlement licenses, so you must purchase a license to enable the required FSM functionality. The part number to order the management node is shown in the following table. * x in the Part number represents a country-specific letter (for example, the EMEA part number is 8731A1G, and the US part number is 8731A1U). Ask your local IBM representative for specifics. 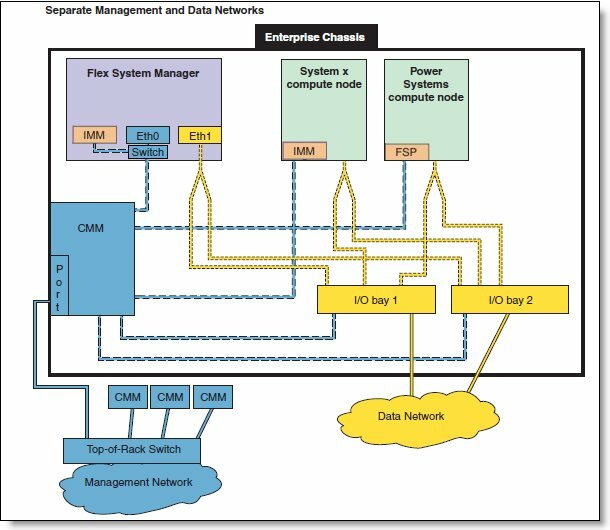 The FSM management node ships with a preinstalled IBM Systems management stack. The part numbers to order Features on Demand (FoD) software entitlement licenses are shown in Table 2 (for United States, Canada, Asia Pacific, and Japan) and Table 3 (for Latin America and Europe/Middle East/Africa). The part numbers for the same features are different across geographies. Ask your local IBM representative for specifics. * The Advanced Upgrade and Fabric Provisioning licenses are applied on top of the IBM FSM base license. Fabric provisioning functionality is included in the advanced feature set. It is also available as a separate Fabric Provisioning feature upgrade for the base feature set. The Advanced Upgrade and the Fabric Provisioning feature upgrade are mutually exclusive, i.e. either the Advance Upgrade or the Fabric Provisioning feature upgrade can be applied on top of the base feature set license, but not both. Important: The Advanced Upgrade and Fabric Provisioning licenses are applied on top of the IBM Flex System Manager base license. A real-time, multichassis view of hardware components with overlays for additional information. Automatic detection of issues in your environment through an event setup that triggers alerts and actions. Identification of changes that might impact availability. Server resource utilization by virtual machine or across a rack of systems. Automated discovery of physical and virtual servers and interconnections, applications, and supported third-party networking. Configuration profiles that integrate device configuration and update steps into a single interface, dramatically improving initial configuration experience. Chassis and hardware component views. Component names and hardware identification numbers. Management of network switches from a variety of vendors. Discovery, inventory, and status monitoring of switches. Support for KVM, pHyp, VMware virtual switches, and physical switches. Per-virtual machine network usage and performance statistics provided to VMControl. Logical views of servers and network devices grouped by subnet and VLAN. Defines QoS settings for logical networks. Configures QoS parameters on network devices. Provides advanced network monitors for network system pools, logical networks, and virtual systems. Discovery of physical and virtual storage devices. Physical and logical topology views. Support for virtual images on local storage across multiple chassis. Inventory of the physical storage configuration. Disk sparing and redundancy management. Support for virtual volume discovery, inventory, creation, modification, and deletion. Support for VMware, Hyper-V, KVM, and IBM PowerVM®. Discovers virtual server, storage, and network resources and visualize the physical-to-virtual relationships. Creates new image repositories for storing virtual appliances and discover existing image repositories in your environment. Imports external, standards-based virtual appliance packages into your image repositories as virtual appliances. Captures a running virtual server that is configured the way you want, complete with a guest operating system, running applications, and virtual server definition. Imports virtual appliance packages that exist in the Open Virtualization Format (OVF) from the Internet or other external sources. Deploys virtual appliances quickly to create new virtual servers that meet the demands of your ever-changing business needs. Creates, captures, and manages workloads. Creates server system pools, which enable you to consolidate your resources and workloads into distinct and manageable groups. Deploys virtual appliances into server system pools. Manages server system pools, including adding hosts or additional storage space and monitoring the health of the resources and the status of the workloads in them. Groups storage systems together using storage system pools to increase resource utilization and automation. Manages storage system pools by adding storage, editing the storage system pool policy, and monitoring the health of the storage resources. Manages assignments of Ethernet MAC and Fibre Channel WWN addresses. Monitors the health of compute nodes, and automatically, without user intervention, replace a failed compute node from a designated pool of spare compute nodes. Preassigns MAC addresses, WWN addresses, and storage boot targets for the compute nodes. Creates addresses for compute nodes, saves the address profiles, and deploys the addresses to the slots in the same or different chassis. Resource-oriented chassis map provides an instant graphical view of chassis resources, including nodes and I/O modules. A fly-over provides an instant view of an individual server's (node) status and inventory. A chassis map provides an inventory view of chassis components, a view of active status requiring administrative attention, and a compliance view of server (node) firmware. Actions can be taken on nodes, such as working with server-related resources, showing and installing updates, submitting service requests, and launching into the remote access tools. Resources can be monitored remotely from mobile devices, including Apple iOS based devices, Google Android based devices and RIM BlackBerry based devices. Flex System Manager Mobile applications are separately available under their own terms and conditions as outlined by the respective mobile markets. Ability to open video sessions and mount media, such as DVDs with software updates, to their servers from their local workstation. Remote Keyboard, Video, and Mouse (KVM) connections. Remote Virtual Media connections (mount CD/DVD/ISO/USB media). Power operations against servers (Power On/Off/Restart). Health status (such as processor utilization) on all hardware devices from a single chassis view. Notifies IBM of problems to escalate problem determination. Administrative capabilities, such as setting up users within profile groups, assigning security levels, and security governance. Bare metal deployment of hypervisors (VMware/ESXi, KVM) through centralized images. Remote restart for Power Systems provides the capability to activate a PowerVM partition on any appropriately configured running server in the unlikely event that the partition’s original server and any associated service partitions or management entities becomes unavailable. FSM capacity utilization allows the system administrators to understand remaining FSM management capacity. The IBM Flex System Manager management node has two types of interfaces that can be configured. The Eth0 interface (two 1 Gb Ethernet management ports) and the IMM2 network interface are connected to the basic Layer 2 switch integrated into the FSM hardware. The integrated switch is connected to the Chassis Management Module (CMM) through the chassis internal management network. The CMM is connected to a top-of-rack switch that effectively extends the chassis management network outside of the chassis and provides a central connection point for all Enterprise Chassis hardware to be managed by the IBM Flex System Manager management software. These connections are referred to as the management network. The management network is shown in the following figure. The management network is used to complete management-related functions for the various endpoints that are managed by the IBM Flex System Manager management software, such as other Enterprise Chassis and compute nodes. During initialization, the management software discovers any Enterprise Chassis on the management network. The management node console can be connected to the management network or to the data network. The IBM Flex System Manager management node Eth1 interface (two 10 Gb Ethernet ports) must be connected to the chassis switch modules that are installed in I/O bay 1 or bay 2. This setup is referred to as the data network. You can configure a switch module in bay 1 or bay 2 to map Eth1 to one of its external Ethernet ports, as you would configure the other nodes in the chassis that are connected to the external network. The data network is used by applications and operating systems and can support data transfer rates up to 10 Gbps if a chassis switch module that is capable of 10 Gbps is installed. One of the key functions that the data network supports is discovery of operating systems on the various network endpoints. Discovery of operating systems by the IBM Flex System Manager is required to support software updates on an endpoint such as a compute node. The IBM Flex System Manager Checking and Updating Compute Nodes wizard assists you in discovering operating systems as part of the initial setup. Managed systems without any IBM Flex System Manager software installed. IBM Flex System Manager communicates with the managed system through the operating system. Managed systems without any IBM Flex System Manager software installed. IBM Flex System Manager communicates with the managed system through something other than the operating system, such as a service processor or a hardware management console. Managed systems with Platform Agent installed. IBM Flex System Manager communicates with the managed system through the Platform Agent. Managed systems with Common Agent installed. IBM Flex System Manager communicates with the managed system through the Common Agent. The following table lists the agent tier support for the managed systems. Managed system types include x220, x222, x240, and x440 compute nodes supporting Windows, Linux, and VMware, p24L compute node supporting Linux, and p260, p270, and p460 compute nodes supporting IBM AIX®, IBM i, and Linux. The following table summarizes the management tasks supported by the compute nodes (depending on agent tier). The following table shows supported virtualization environments and their management tasks. ** Supported only for virtual servers that are running IBM i v7.1, TR4 PTF group SF99707 level 4, or later. The following table shows supported I/O modules and their management tasks. The following table shows supported virtual switches and their management tasks. The following table shows supported storage systems and their management tasks. The IBM FSM Explorer console provides an alternate resource-based view of your resources and helps you manage your Flex System environment with intuitive navigation of those resources. Configuring local storage, network adapters, boot order, and Integrated Management Module (IMM) and Unified Extensible Firmware Interface (UEFI) settings for one or more compute nodes before you deploy operating-system or virtual images to them. Installing operating system images on X-Architecture compute nodes. Navigating resources, viewing the properties of resources, and performing some basic management tasks such as power on and off, collect inventory, and working with LEDs. Using the Chassis Map to edit compute node details, view server properties, and manage compute node actions. Working with resource views, such as All Systems, Chassis and Members, Hosts, Virtual Servers, Network, Storage, and Favorites. Visual monitoring of status and events. Viewing event history and active status. Visual monitoring of job status. For other tasks, you are launched from IBM FSM Explorer into IBM Flex System Manager in a separate browser window or tab. You can return to the IBM FSM Explorer tab when you have completed those tasks. The Mobile System Management application is a simple, free tool that you can download for a mobile device that has an Android, Apple iOS, or BlackBerry operating system. The Mobile System Management application enables you monitor your IBM Flex System hardware remotely. The command-line interface (CLI) is an important interface into IBM Flex System Manager management software, and it can be used to accomplish simple tasks directly or as a scriptable framework for automating functions that are not easily accomplished from a graphical user interface. The IBM Flex System Manager management software includes a library of commands that you can use to configure the management software or perform many of the systems management operations that can be accomplished from the management software web interface. The IBM Flex System Manager Node has a 3-year, customer-replaceable unit (CRU) limited warranty. IBM Flex System Manager licenses include one year or three years of Software Subscription and Support. If a new release of an offering in this announcement is made generally available in IBM Passport Advantage® after the announcement of the offering in System x ordering systems, you may elect to take delivery of any release generally available for that offering during the product registration process. Maximum altitude: 3,048 m (10,000 ft.) at 28 degrees C. Decrease the maximum altitude by 1,000 ft. for every 1 degree C increase in ambient temperature up to 3,000 ft at 35 degrees C ambient. Hyper-V®, Internet Explorer®, Microsoft®, and Windows® are trademarks of Microsoft Corporation in the United States, other countries, or both.